Steve G. Jones, Ed.D., Clinical Hypnotherapist, charges $1,500 for a custom recording and $25,000 for a one-hour private hypnotherapy session at his office. But you can get all the benefits for this low price. 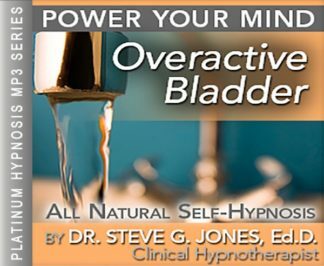 Simply listen to the Overactive Bladder Hypnosis MP3 every night as you go to bed for three weeks and feel the changes happening in your life. You will feel more empowered, more in touch with your true self, and you will truly know that your goals are within your reach. Steve G. Jones achieves AMAZING and LASTING results!!! Hypnosis is the easiest way to affect change in your life because the positive messages go straight to your subconscious mind effortlessly so you can accomplish your goals and reach for the stars!! All you have to do is listen to the Overactive Bladder Hypnosis MP3 download at night as you go to sleep!!! You’ll hear soft music, the gentle sounds of the beach, and the soothing sound of Steve G. Jones’ voice all working together to bring about positive changes in your life easily and naturally. Steve G. Jones has been helping people improve their lives with hypnosis for over 17 years…now it’s time for him to help YOU… don’t wait, do it NOW !!! you’ll be glad you did. See you at the top! And as you continue relaxing deeper and deeper and more deeply relaxed. I would like you to focus on your bladder. And imagine it being calm and relaxed. Your bladder is calm and relaxed at all times because you are calm and relaxed. Imagine the muscles around your bladder relaxing, that’s right. Yet, you are able to hold in urine. So although the muscles are relaxed and calm, they still do their job of holding in urine. In fact, they only release urine when you direct them to do so, that’s right. The muscles are calm and relaxed, yet they do their job, quickly. And your bladder notifies you well in advance when you are going to need to urinate, giving you plenty of time to get to the bathroom, get to the toilet, and urinate, that’s right. As your bladder fills, your brain is notified well in advance of when your bladder will be full. And your bladder holds in all of the urine that it gathers until you tell it to release the urine. And you are able to sleep through the night without urinating. You are able to sleep through the night and urinate when you wake up in the morning, when you are ready to urinate at the toilet. You are so very relaxed, realizing that day by day, your bladder is listening to you more and more, only urinating when you command it to do so. Your bladder allows you to sleep through the night because you command it to hold in the urine through the night, allowing you to sleep peacefully. You are so relaxed at all times and day by day your bladder is becoming more and more…an organ that obeys you and works together with you and the rest of your body in harmony. You are so very relaxed at all times. Overactive bladder is a condition that can cause you to suddenly need to urinate. This often coincides with frequency of needing to urinate and/or the inability to suppress urination. This can be embarrassing and have a negative effect on your life. You do not have to endure the worry any more. Hypnotherapy can help you overcome overactive bladder in a safe, natural, and easy way with the Overactive Bladder Hypnosis MP3. Hypnosis immediately starts working on your subconscious mind. You will be relaxed into a deep state of relaxation during the first part of the hypnosis session. Then your subconscious mind will receive an influx of powerful and positive suggestions to re-program your mind and your body to overcome OAB. We suggest you listen to this Overactive Bladder Hypnosis MP3 recording for 21 nights in a row before going to bed at night. You will hear the relaxing and soothing voice of Steve G. Jones. He uses over 20 years of expertise to target your OAB and eliminate it once and for all!